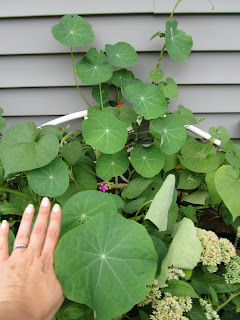 My "spitfire" nasturtiums have really taken off. Can you believe the size the of the leaves on them? They are almost as big now, as the ones I saw in Alaska in late spring. These are the ones that I started uses my water bottle cloches in early spring. The ones I started once the threat of frost was gone this spring, are no where near this size. Speaking of frost.....there was actually a frost watch out for upper Wisconsin this weekend. We were "up-north" for the weekend, and one morning it was in the upper 30's. Yes, welcome to Wisconsin. Just this past week it was 90 and humid, we were running the air. This weekend we were running the heat up at the cabin. And yes....the earwigs are still eating the leaves on my plants. I'm growing spitfire nasturtiums for the Seed Grow Project. Thanks to Renee's Garden for the seeds! Wow...those are big leaves! More for the earwigs to eat! lol. Wow! My Nastie leaves were huge too! They look great! Those leaves are huge! Get those earwigs! Yuk! I never thought of cooking with the leaves. I've eaten the flowers before. This is the second one I've seen this month with ginormous leaves. What are you guys feeding them?